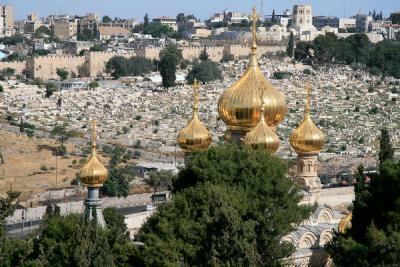 The Church of Saint Mary Magdalene is located on the western slope of the Mount of Olives, between the Catholic Garden of Gethsemane and Dominus Flevit. It is a (white) Russian Orthodox Church built by the Czar Alexander III in 1888. The church was dedicated to Alexander's mother, Maria, but is named after Saint Mary Magdalene who was a follower of Jesus and is associated with anointing his body. She was at the foot of the cross (John 19:25), and Jesus first appeared to her after his resurrection (John 20:1). While under construction a tombstone was found (from the Second Temple Period) mentioning the Old Testament Judean king Uzziah. At one time it must have marked a secondary burial of the king. This artifact is now in the Israel Museum.